The sensational first test match between cricket teams of England and Pakistan has put England under tremendous pressure. 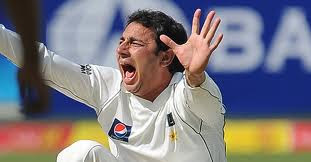 The 7-55 by Pakistan's Saeed Ajmal was too demoralizing for the English squad. It thus remains to be seen which side starts the match Wednesday and how the flat surfaced pitch of Sheikh Zayed stadium of Abu Dhabi behaves and to whose favours. Misbah (Captain), Hafeez, Farhat,Taufiq, Azhar, Younis, Asad, Umar Akmal, Adnan Akmal, Umar Gul, Junaid, Aizaz, Wahaab, Talha, Saeed Ajmal, Abdul Rehman. Andrew Strauss(Captain), Alistair Cook, Jonathan Trott, Kevin Pietersen, Ian Bell, Eoin Morgan, Matt Prior †, Stuart Broad, Greme Swann, Monty Panesar, James Anderson, Chris Tremlett. Weather is expected to be typical sub-continent, dry and sunny with desert wind picking up around afternoon. Temperatures will range between 26°C to 11°C. Flat surface at Sheikh Zyed stadium is likely to favour the spinners and put the English team under-pressure. England squad will have to keep their wits about, while Pakistani side will have to control their temperatures after winning the first test match.